Greatest Film Director Cameos: Herein is a small collection of the most famous appearances by directors on the front side of the camera, in films of their own making (in alphabetical order by film title). Many directors have enjoyed appearing in their own films (some as unbilled or uncredited cameos, others as bit players, either in small walk-on roles or in major supporting roles). There are numerous on-screen appearances of directors who crossed over and took the route toward directing: actors who became directors (Ron Howard, Penny Marshall), actors who also direct (Clint Eastwood, Robert Redford), director-actor auteurs (Woody Allen, Spike Lee, Sylvester Stallone), and various other combinations. 37 of Alfred Hitchcock's films Alfred Hitchcock made a total of 37 self-referential cameos in his films over a 50 year period (from 1926-1976), if one counts his narration at the start of The Wrong Man (1956). 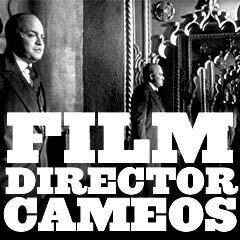 See this site's extensive writeup (in two parts) of "Alfred Hitchcock's Film Cameos." Terrence Malick: an unexpected visitor at door, with blueprints, in Badlands (1973) - credited as "Caller at Rich Man's House"
Mostly major roles in his own films: Sylvester Stallone As the heroic underdog Philadelphian boxer, actor/star Stallone appeared in all six Rocky films (from 1976 to 2006, over a thirty-year period), and wrote all the screenplays as well; however, he only directed four of the six films, letting John G. Avildsen take the directorial helm for Rocky (1976) and Rocky V (1990). Stallone also directed himself as the Vietnam War vet John Rambo in Rambo (2008), and wrote the screenplays for all four Rambo films (1982, 1985, 1988, and 2008) to date, and was in production for Rambo V: The Savage Hunt (2011). Strong roles in many of his own films: Orson Welles Welles, of course, appeared in over a dozen of his own films: most notably Citizen Kane (1941), The Stranger (1946), The Lady From Shanghai (1948), Macbeth (1948), Touch of Evil (1958) and Chimes at Midnight (1965), but did have a cameo role as the Narrator in The Magnificent Ambersons (1942). See The Trial (1963) below for Welles' truest cameo role appearance. Many prominent roles in his own films: Mel Brooks Brooks appeared in Blazing Saddles (1974) as Governor Lepetomane, and then in his first leading role in Silent Movie (1976) as Mel Funn, and then in others of his films including: High Anxiety (1977) as Dr. Richard H. Thorndyke, History of the World Part I (1981) in multiple roles as Moses / Comicus / Torquemada / Jacques / and King Louis XVI, in To Be or Not to Be (1983) as Dr. Frederick Bronski, in Spaceballs (1987) as President Skroob / Yoghurt, and in Robin Hood: Men in Tights (1993) as Rabbi Tuckman. Notable supporting roles in his own directorial efforts: Danny De Vito De Vito as child-like Owen Lift in Throw Momma From the Train (1987) (his directorial debut), reluctant divorce lawyer Gavin D'Amato in The War of the Roses (1989) (pictured), trucker Bobby Ciaro who became Hoffa's right-hand man in Hoffa (1992), used car salesman and parent Harry Wormwood in Matilda (1996), slimy agent Burke Bennett in Death to Smoochy (2002); and a true cameo role as the Narrator in Duplex (2003). Roles in his own films: Kevin Smith Kevin Smith has appeared in four of his own films (Clerks (1994), Mallrats (1995), Chasing Amy (1997), and Dogma (1999)) in the recurring cameo role of Silent Bob (partnered with Jay Mewes as Jay) - a fifth time was as a lead character in Jay and Silent Bob Strike Back (2001). Roles in his own films: Clint Eastwood Play Misty for Me (1971) - Clint Eastwood as late-night California DJ Dave Garver, who has an unfortunate encounter with a mysterious caller named Evelyn Draper (Jessica Walter) who repeatedly requested the song "Misty." Lead roles in all of his own films: Albert Brooks Albert Brooks has starred in and written every film he has directed, including the roles of Himself in Real Life (1979) (pictured), film editor in Modern Romance (1981), yuppie adventurer David Howard in Lost in America (1985), neurotic and recently killed Daniel Miller in Defending Your Life (1991), blocked sci-fi writer John Henderson in Mother (1996), troubled Hollywood screenwriter Steven Phillips in The Muse (1999), and Himself in Looking for Comedy in the Muslim World (2006). Mostly strong roles in his own films: Erich von Stroheim Erich von Stroheim had many lead roles in his own films, most notably as young impoverished Prince Nicki von Wildeliebe-Rauffenburg, a Lieutenant of the Guard in pre-WWI Vienna in The Wedding March (1928) (pictured). He also starred as Austrian military officer Lieutenant Erich von Steuben in Blind Husbands (1919), Don Juan-like Count Wladislaw Sergius Karamzin in Foolish Wives (1922), ventriloquist Gabbo in The Great Gabbo (1929), and as Austrian officer Hauptmann Oswald Von Traunsee in Fugitive Road (1934). Stroheim did have a cameo in his most famous film, Greed (1924), as a balloon vendor in a scene that was removed when eight hours were truncated from the epic film. Airplane! (1980) David and Jerry Zucker as ground crewmen, who accidentally cause a jumbo jet to crash into the airport terminal, while Jim Abrahams, as one of the religious zealots in the terminal, pesters (and gets attacked by) Capt. Rex Kramer (Robert Stack). Alien (1979) In the shot where Kane (John Hurt) peered into a translucent egg, the facehugger was played by a pair of gloved hands belonging to director Ridley Scott. All Quiet on the Western Front (1930) In the final closeup of Lew Ayres' hand as it stretched out (and was shot) to reach a butterfly close to the warfare trench, the hand belonged to director Lewis Milestone. Apocalypse Now (1979) Francis Ford Coppola played himself, somewhat, as the director of a TV news film crew getting mock footage for the evening US news, shouting out directions to American soldiers as they took over a Vietcong-controlled coastal village: "Don't look at the camera! Just go by like you're fighting. Like you're fighting. Don't look at the camera! This is for television. Just go through, go through." Being There (1979) Hal Ashby, in an uncredited brief cameo in a newsroom as a "Man at File Cabinet at Washington Post"
Blazing Saddles (1974) Mel Brooks took the parts of star, director, producer, and writer in most of his films (however, he did not have an acting role in Young Frankenstein (1974) and was only featured as the sound of a howling werewolf). His most famous appearances were in this film, in multiple roles (the first was a major part): the bewildered, sleazy, womanizing Governor LePetomane, and also two cameos as a Yiddish-speaking, Jewish-Sioux Indian chief, and as a WWI aviator in a badman lineup. Breathless (1960, Fr. ), aka A bout de Souffle Jean-Luc Godard took the role of an informer - a man reading a newspaper front-page story of a murder - who looked up and spotted the real murderer, and then told the cops. Chinatown (1974) Roman Polanski portrayed a switchblade-wielding, maniacal, intimidating hoodlum who threatened inquisitive detective Jake Gittes (Jack Nicholson), to warn him to stop snooping (nosing) around in the case, with: "You're a very nosy fellow, kitty-cat, huh? You know what happens to nosy fellows? Huh, no? Want to guess? Huh, no? OK. They lose their noses." Gittes had one nostril viciously cut with the knife, followed by more intimidation: "Next time you lose the whole thing. (I) Cut if off and feed it to my goldfish. Understand? Understand!?" A Countess from Hong Kong (1967) In this romantic comedy flop, Charlie Chaplin's final film (and the only one funded by a major studio - Universal), in which he served as writer and director, he appeared with only a short cameo (as a nameless, seasick, white-haired elderly steward). It was the first (and only) color film (and widescreen film) that Chaplin ever made. 1993: as a Knight in Sweatshirt and Sneakers, who assured Ash (Bruce Campbell): "You can count on my steel"
The Fly (1986) David Cronenberg played an obstetrician delivering a giant, squirming bloody larva in the nightmarish dream sequence experienced by hapless scientist Seth Brundle's (Jeff Goldblum) girlfriend/OMNI reporter Veronica Quaife (Geena Davis). Fox and His Friends (1975) (aka Faustrecht der Freiheit) Rainer Werner Fassbinder as naive working-class Franz Bieberkopf (alias 'Fox') who wins the state lottery.